Please fix the SSL certificate? 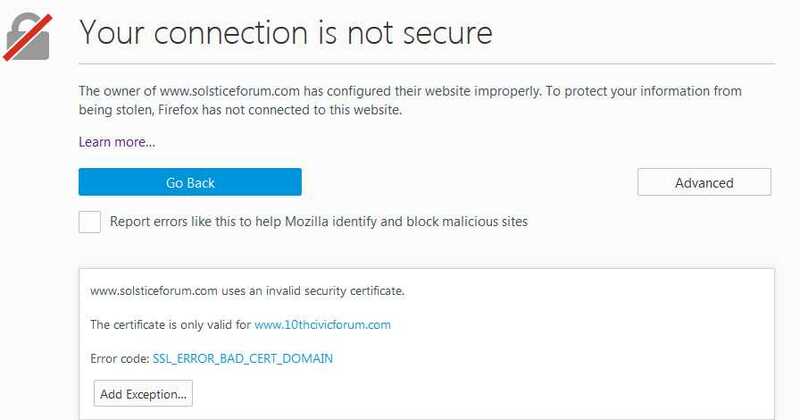 If you use https://www.solsticeforum.com, it redirects you to 10thcivicforum.com. Life moves fast, don't miss a thing. Agreed. Given the past security issues on these sites, functional SSL would be very nice. I have contacted the AutoGuide techs regarding the issue. I'm not seeing the same redirect to 10civicforum.com as you; only the message that this site does not use SSL, as should be displayed since we currently don't use it. Tech has been working on this over the past year and will be rolling it out across the network in the next couple months. Your passwords are still never stored in plain text. HTTPS is just an additional security measure that protects against specific attacks, like MIM (Man in the middle). While mine is not redirecting, I can see why some browsers may redirect. I attempted this on a few other browsers and I was able to bring this up as well. It looks like tech is using 10thcivicforum.com for some testing, and it somehow bubbled over to this site. I'll bring this up with them in our meeting today and hopefully get it sorted out. For the time being, until SSL is fully implemented here, you should just continue to use the https://www.solsticeforum.com URL. I have this issue about every other time I click on a topic. If I go back and click again it usually works. I am using Firefox. Ditto, we've been hacked run for your lives! Indeed, https://www.solsticeforum.com still takes me to the civic forum as well. https://www.solsticeforum.com seems to work fine. Same with me. When I go to Civic it is the https site. we have not yet implemented SSL on our forums. this is still in the works since we're planning a global patch update rather than a single one. right now we're still testing this to make sure there are no issue with SSL on our sites. Yes, I have been getting that 10th Civic Forum page way toooo much! I was attributing it to something about my laptop. Good to know it is a known issue being worked on. I was considering limiting use of the website, but will hang with it longer. Yes for the moment, don't use https:// which will give you the warning. We are definitely doing something about this at the moment just like what Lee said, please be patient everyone!